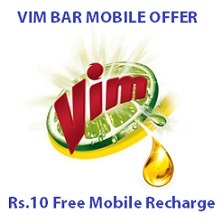 Redeem Vim Bar Free Mobile Recharge Offer to get Rs.10 Free Talktime. VIM BAR MOBILE OFFER is brought to consumers by Hindustan Unilever Limited (HUL) for promotion of the Vim Bar brand. This offer is applicable across all telecom providers. =>NOTE: The Campaign starts at 12 Midnight IST on 10th August, 2014 and ends on 15th November, 2014 at 11:59 PM IST. Post-paid mobile phones are not eligible for mobile recharge during this offer. 1. Purchase a VIM BAR 80g, 130g, 300g, 200gx3 and 500g Bar. 2. Open the pack, locate the unique code printed within, and give a missed-call to 080-910-11111. 3. You will receive a IVRS automated call back on behalf of HUL. 4. Follow the instructions in the call for (a) entering the unique product code and (b) participating in a brief Consumer survey. 6. Free Mobile recharge will be confirmed via SMS to the Consumer. Each unique product code is valid for one Campaign entry only. The mobile recharge will be done within 6 working days. HUL reserves the right to alter, modify or change any terms and conditions herein or modify/change, discontinue, terminate, withdraw the Campaign at any time during the Campaign Period at its sole discretion without prior notice or assigning any reason. We bought 6 VIM Bar Tub (500gms) with so called assured Rs. 10 recharge with every bar. The toll free # given on the coupon is wrong and one will never get thru the number. MOst of the time you will get to hear message saying ” kindly check the number you have dialed. This continued till end of scheme and now when i got thru the #, I got an auto txt message saying ” VIM mobile offer me call karne ke liye Dhanyawad! Yeh offer ab sampat ho chuka hai. I had bought VIM BAR TUB (500 Gms.) & used Unique Codes :(1) 28083967221, (2)26725299099, (3) 29366922930 & (4) 21039497517 on 20.09.2014. I got response SMSs “Dhanyvad. Aapne Jita hai Rs.10 ka recharge. Apna muft recharge pane ke liye krupya 6 karyadivas de. Jitne ki sambhavna ke liye zyada Vim bar kharide.? Sender: VM-VIMBAR. Despite the elapse of 6-day period, I have not yet got the recharges. In this regard, I have registered my grievance vide Gr. No.4002226659 dated 25.09.2014. I am still awaiting the recharges.